Texas Lt. Gov. 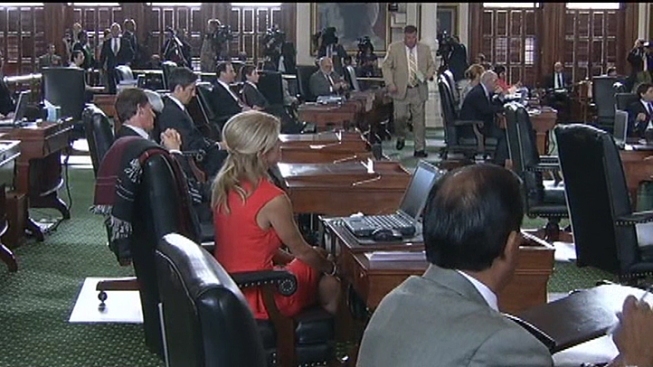 David Dewhurst gaveled in the chamber shortly after 2 p.m. and by 2:30 p.m. a recess was called. The Senate began with Dewhurst warning that anyone making outbursts in the gallery would be removed. Soon after, a short discussion was had after Sen. Royce West (D) inquired about parliamentary procedure regarding which clock in the chamber was the official clock and if there was a procedure for disputes about the actual time. West's inquiry was reducing to writing between Dewhurst, West and Sen. Kirk Watson. Up next, Sen. John Whitmire (D) proposed a recess until after the July 4 holiday. "Mr. President, I move that the Senate stand in recess until 11 a.m. Tuesday July 9, pending reciept of messages through reading and referral of bills and reciept of committee reports," said Whitmire. There were no objections to Whitmire's motion and the Senate is now in recess. Although there will be no further action on either floor until next week, committees will be in session this week. The chairman of the House State Affairs Committee said he'd cut off testimony on the bill at midnight Tuesday and expects the full House to get it next week. The Senate gallery was full but calm as the session began after a boisterous demonstration outside. Round two of Texas' fierce ideological battle over abortion limits began Monday, with demonstrators filling the state Capitol and riot police on standby less than a week after a Democratic filibuster and hundreds of raucous protesters threw the end of the first special session into chaos. The Legislature's Republican majority has vowed to pass wide-ranging abortion restrictions quickly and easily this time, even as opponents mobilize for more protests. "The world has seen images of pro-abortion activists screaming, cheering," Republican Gov. Rick Perry said. "Going forward, we have to match their intensity but do it with grace and civility." VideoDavis: Perry's Single Mom Dig "Without Dignity"
Hundreds of abortion-rights groups gathered on the Capitol's front steps hours before a rally was scheduled to begin, while horse-mounted state troopers and police from as far away as Houston watched. More than 100 state police, many carrying helmets and truncheons, staged inside the Capitol building and newly erected crowd control barriers funneled visitors away from the entrances to the House and Senate chambers. Opponents of the proposed law restricting where, when and how a woman may obtain an abortion wore orange T-shirts and prepared for a rally with national women's rights leaders. Supporters wore blue and recited the Lord's Prayer outside the Senate. On the extra session's last day, however, Democratic Sen. Wendy Davis of Fort Worth was on her feet for more than 12 hours -- speaking most of that time -- as Democrats used a filibuster to help kill the sweeping abortion bill. Since gaining national fame following her filibuster, Davis has admitted she has aspirations for higher office, but hasn't said when she'll pursue it. As the midnight deadline loomed, Republicans used parliamentary technicalities to silence her, but hundreds of protesters in the public gallery and surrounding Capitol corridors cheered so loudly that senators on the floor weren't able to hear, and the bill died as the clock ran out. Gov. 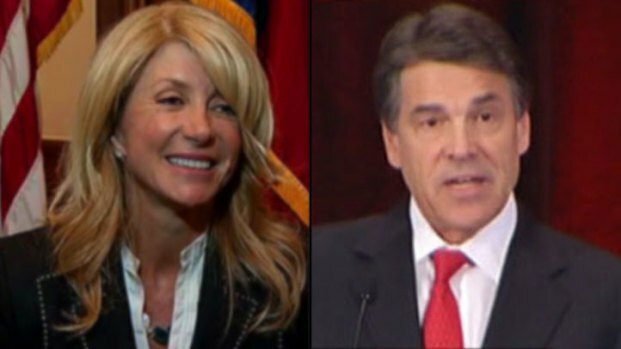 Rick Perry on Thursday admonished the star of a Democratic filibuster that helped kill new Texas abortion restrictions, saying state Sen. Wendy Davis' rise from a tough upbringing to Harvard Law graduate should have taught her the value of each human life. The scene was chaotic enough that Sen. Donna Campbell, a New Braunfels Republican, called for the gallery to be cleared. With lawmakers now heading back, she said, "I believe more presence by law enforcement will help keep disruptive behavior from thwarting the democratic process." She said more families may turn up to express their views and "every Texan's voice deserves to be heard. Not just the noisiest and unruliest." "I'm always part of the unruly mob. We refuse to be ruled," she said. "Poor women, women of color, rural women. If they need abortion they will not be able to get an abortion. Health care in Texas is already difficult for people in poverty to access." "I want the Legislature to be getting work done that actually that they had, by and large, finished," he said. House Speaker Joe Straus and Lt. Gov. David Dewhurst, who oversees the Senate, haven't revealed plans to do anything differently in the second special session -- but it's lost on no one that moving through the process faster, and ensuring both chambers carry out final votes long before the end of the session, will limit Democratic stall tactics and make any possible filibuster moot because too much time would be left. Supporters say such limits will safeguard women's health, but opponents argue the requirements are intended to stop abortions through over-regulation. Only five out of 42 clinics qualify as ambulatory surgical centers and they are located only in major metropolitan areas. Dewhurst has acknowledged that the ultimate goal is to shutter abortion clinics. Davis, who donned pink tennis shoes for the marathon speech that made her an overnight political sensation nationwide, hasn't said if she would try something similar again. And, calling more special sessions has squashed Democratic stonewall tactics before. In 2003, House Democrats fled to Oklahoma to keep the chamber from making quorum and passing new redistricting maps that benefited Republicans. When Perry called a first and then second special session, Senate Democrats headed to New Mexico. But the maps were approved during a third extra session that year. Even so, Gilberto Hinojosa, chairman of the Texas Democratic Party, vowed: "As this last week has shown, we are ready to fight." The Texas Senate has convened for a new 30-day special session to take up contentious abortion restrictions bill and other issues.